Location is a private venue in Scottsdale. The address will be provided at time of registration. Don't miss out on this opportunity to enjoy an evening with Pieter and see his inspiring works of art, even if you cannot attend the weekend workshop. ​Enjoy this two-day workshop with Pieter Weltevrede on the sacred and ancient art/discipline of Yantra painting. Experience clarity of mind, inner peace, and connect with your creativity while discovering the delights of constructing and painting your own Yantra. We begin with the mandala with the vedic square, carefully drawing the sacred geometry, then painting with the specific colors. All materials provided, but you are welcome to bring a pencil, eraser, compass and/or straight edge with metric measurements. No experience necessary. Please sign up in advance. Internationally-recognized Dutch master artist Pieter Weltevrede is a disciple of Harish Johari and also studied with Johari's teacher Master Chandra Bal and Suresh Johari. Pieter has painted hundreds of exquisite works of Hindu Gods and Goddesses, Yantras and Mandalas. He tours annually in India, Europe and the USA exhibiting his art and giving painting workshops. 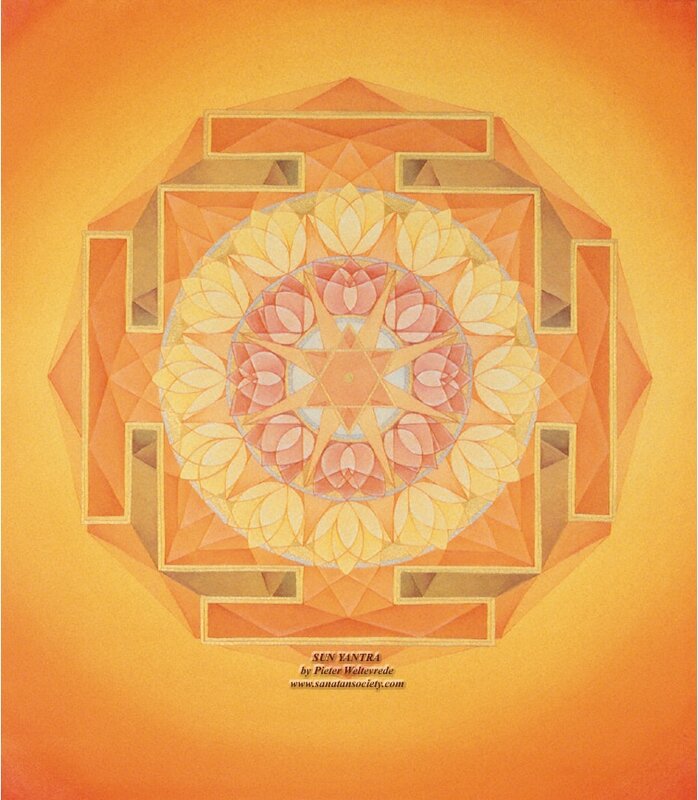 A yantra is a powerful meditation tool, both through the process—plotting the mathematical structure and systematically painting it—and as a symbol of the mantra it represents (with a central focal point). Focus and quiet concentration are required. The visual and nonverbal right hemisphere of the brain is enlisted. With the inner silence comes self-awareness. Watch your experience and find the center again. Encountering the symmetrical, geometric pattern fosters inner harmony. Elevate your consciousness by connecting to the Divine, the universal cosmology. The act of drawing and painting Yantras is a deeply meditative experience and it teaches the mind how to concentrate, how to be one-pointed. This practice is fascinating and absorbing and creating a Yantra can yield valuable lessons. 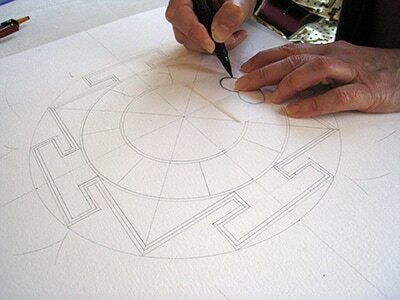 Yantra drawing requires accuracy, exactness, discipline, concentration, neatness and patience. The geometrical forms of the Yantra activate the right hemisphere of the brain, which is visual and nonverbal. Especially for Westerners, who are more left hemisphere dominated and are deficient in right hemisphere education which causes some loss of imagination and of faith in higher values. Right hemisphere education through art, dance and music is needed to restore the balance. By coloring and drawing the geometrical Yantra diagrams, based on the mathematical perfection of sages of the East, Westerners can make both their hemispheres work simultaneously and calmly, achieve faith and live in constant awareness. Yantras are visual patterns and are expressions of primal mathematical relationships involved in the structure, creation and dissolution of the universe. They are gateways to a mythical world and have a direct and immediate effect on the emotions and the holographic vibrations that govern our existence, individual perceptions and worldview. As a tool, Yantra is used to withdraw consciousness from the outer world, and can help you to go beyond the normal framework of the mind. In 1977 Pieter Weltevrede met his guru, Sri Harish Johari, who was teaching spiritual sciences like chakras, tantra, yoga, numerology etc. Johari was a multitalented artist, who created the Harish Johari wash-technique, that originated in the school of Rabindranath Tagore (Santi Niketan). It is a master technique in watercolors with many washes in gouache. Since 1980, Pieter devoted his time to master this technique and to study Sanatan Dharma. In 1988, he went for the first time to India and met also the art teacher of Johari: Sri Chandra Bal. The teachings culminated in the creation of the book "the Birth of Ganga" with 50-paintings done on silk in the wash technique. After that Pieter created together with Harish Johari and his brother Suresh Johari the book "Little Krishna." In 1999, Harish Johari left his body. After this Pieter published three more children's books with Inner traditions: "How Ganesha got his Elephant Head," "How Parvati Won the Hearth of Shiva," and "Ram the Demon Slayer." Also, he contributed to many books of his guru like "Chakras," "Numerology," 'Leela" "Ayurvedic Massage" and "the Monkey and the Mango Tree." 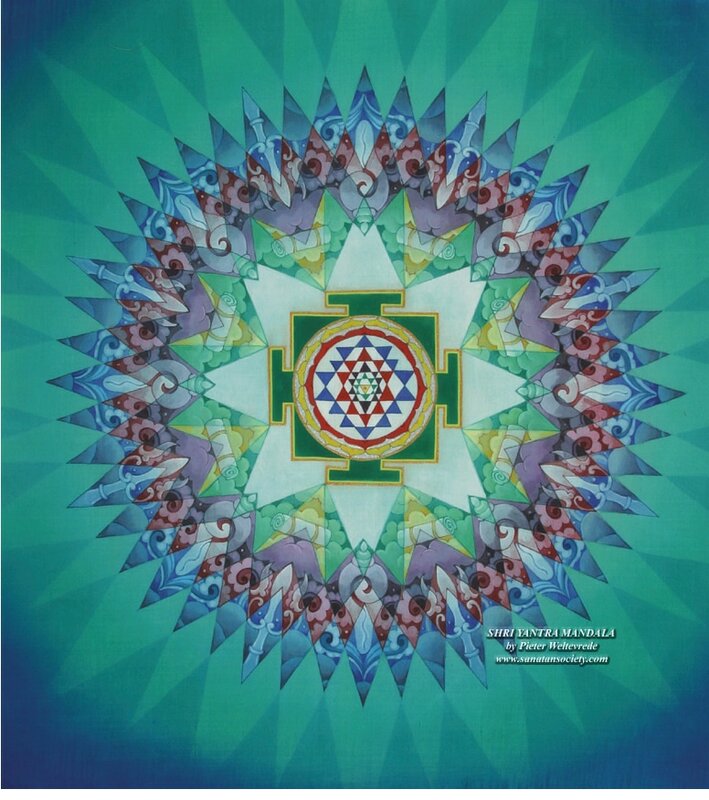 Since the beginning, Pieter is also teaching yantra, mandala and deity painting in the Harish Johari wash-technique. First in Holland and later on in the USA and India. If one does yoga, one has to do something with art. Painting is a way to stay in a meditative mood for days and days. A great way of doing bhajan. Pieter and his wife Geva are still going every year to India to study and practice the Hindu way of living. Besides Haridwar (Ganga) they also stay with Sri Avadh Behari Das Kathiababa in Indore (Narmada) in the hearth of India. Pieter is born in 1955, married and has three children. He has a masters degree in social science. A lot of Pieter's paintings are to be seen on the sanatansociety.org. 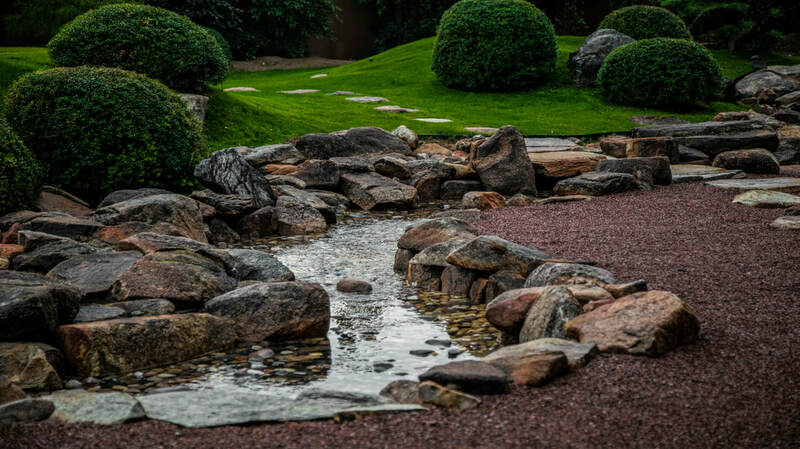 This special two-day workshop will be held at this peaceful private venue. More information will be provided upon registration.